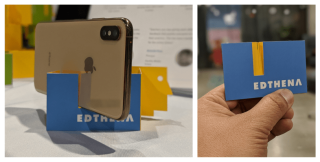 “Whether educators are using smartphones or tablets for filming, the paper tripod is designed to work for most mobile devices popular today,” said Adam Geller, founder and CEO of Edthena. Teachers can use Pairin in their classrooms or in professional learning communities. “Organization Stats aggregates data across all user groups to show how Edthena is being used—not just if it is being used,” said Adam Geller, founder and CEO of Edthena. The UKIT curriculum includes activities that cultivate 21st-century skills such as critical thinking, problem solving, communication, creativity, team-based work and use of technology. PreK-12 educators who are interested in recognition for their media literacy skills can earn certification by completing 8 free micro-credentials. If you’re planning to take advantage of the many different summer PD options, now is the time for finishing up your applications. Apply now for the new HP Teaching Fellowship. Deadline: February 22. Digital Promise Global and HP team up to celebrate innovative middle and high school educators. Program includes attending the Digital Promise Challenge Institute this summer in Monterey. Design your own DIY (Do-It-Yourself) learning that leads to edtech, coding, and makerspace certificates. It’s never too late to make a few 2019 social studies resolutions. Global education technology provider, Promethean®, will preview their latest technology at the Future of Education Technology Conference January 28-30 in Orlando, Florida. Illustrative Mathematics announced it is partnering with Kendall Hunt Publishing Company to be its exclusive distributor of its freely available IM Certified digital curriculum. The International Society for Technology in Education (ISTE) announced the results of its election for board of directors. Instead of just presenting my ideas, we had a brainstorming session. I gave them access to an editable Google Sheets where we began building an action plan. There are many ways technology can help teachers see themselves and their practice more clearly. FEATURE: Invest in Yourself. Just Do It! Tech and Learning recently sponsored a leadership event in Denver on Bridging the Equity Gap. For me, the learning and inspirational message went beyond the topic and technology. A growing number of districts are turning to Illustrative Mathematics (IM) Certified Professional Learning.